Why Opt for Aluminum Louvers? Aluminum louvers allow for airflow while keeping unwanted elements like dirt, water, and debris out. Aluminum louvers are a proven way to reduce your residential heating and cooling costs, maintain a steady indoor temperature, and bring fresh air in and move stale air out. 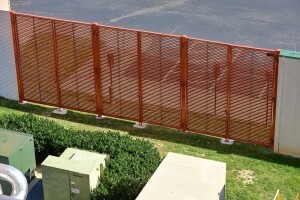 Louvers can be custom-designed to fit into a variety of places including homes, businesses, and even industrial areas. One of the biggest things that determines the efficacy of a louver is the material that it is made from. Aluminum louvers are well-loved for many reasons, some of which we are sharing below. Aluminum is a very versatile and flexible substance, so it can be molded into just about any form depending on the needs of your home or building. The finished aluminum louver can squeeze into the available space with ease. As always, Hercules Custom Louvers will design aluminum louvers that perfectly fit into your requirements. Aluminum is lighter in weight, but at no point should you assume that means it is weak! It is lighter than copper and steel, but can stand up to the same amount of airflow, wind, and weather. Aluminum louvers benefit from aluminum’s amazing strength-to-weight ratio and will work beautifully in your home without putting excess weight on any part. We know it sounds a little bit silly to dwell on the beauty of aluminum louvers, but they are very architecturally striking. Aluminum louvers are an awesome way to make an exterior feel and look complete. Aluminum louvers can be manufactured in a variety of colors to accent or blend in with the outside of your home. Aluminum is also a great option for homeowners concerned about the environmental impact of their building materials. Aluminum is completely recyclable, so it can be reused and recycled many times before it uses its usefulness. Aluminum will not make its way into a landfill, so you can always feel good about using it for your home. Aluminum louvers will serve your home for many decades (and can also serve the inhabitants of your home long after you’re gone!). This entry was posted on Friday, November 10th, 2017	at 3:05 pm	. You can follow any responses to this entry through the RSS 2.0 feed. Both comments and pings are currently closed.